SDCC 2012: Marvel and CIRQUE DU SOLEIL Bring KA to Comic Con Saturday! Bringing a big show to the biggest show. 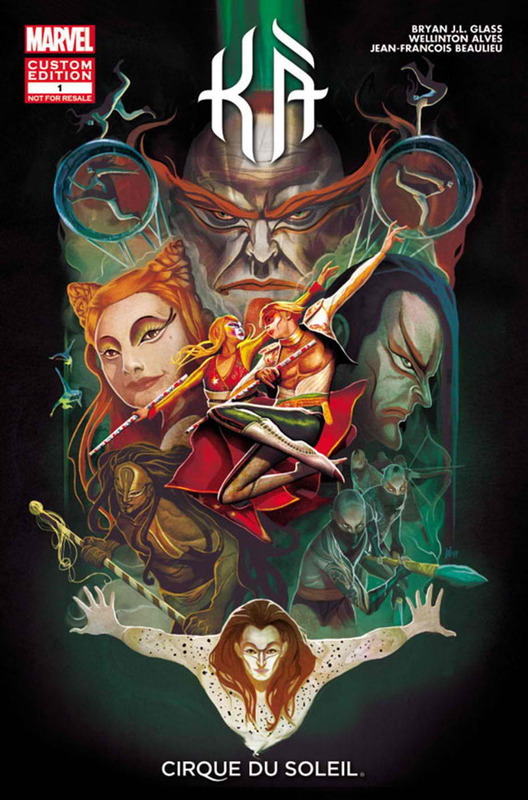 Tomorrow, Saturday, Marvel Comics will debit its first ever comic book partnership with CIRQUE DU SOLEIL, bringing Ka to the four color page. Check out press release below, and drop by Marvel tomorrow to get your own copy! WHAT: The resident production of KÀ by Cirque du Soleil at MGM Grand in Las Vegas and Marvel Entertainment will introduce KÀ #1, an all-new custom comic book, to fans at Comic-Con 2012 in San Diego. Note: the KÀ #1 custom comic book will be distributed in the Marvel Booth #2329 during Comic-Con. rotating stage which forms the backdrop for this cinematic journey of aerial adventure and perpendicular acrobatics. Fans can get an inside look at the making of the comic book by visiting www.kacomicbook.com. Featuring sneak peeks and behind-the-scenes information, including line art, storyboards and more, this site serves as a hub for details on the collaboration. On Twitter, fans can Tweet about the collaboration to @Cirque and @Marvel using the #KAComicBook hashtag. Previous SDCC 2012: WWE Superstars Invade Comic-Con! Next SDCC 2012: Wired Cafe with Kevin Smith and more!! !